I begged and pleaded with my husband a couple of weeks ago for us to attend this year's Los Angeles Times Festival of Books. The last time we went was before my daughter was born. It was one of my favorite bookish events. I used to sign us up for every possible author panel we could fit into our schedule, often leaving very little time to actually peruse the booths. This year I knew there would be no panels. And I knew we wouldn't be able to attend both days of the festival. I figured we could go for a couple hours or so, look around, and then head home. I just wanted to take in the atmosphere. The event is free with the exception of parking. It would be worth it, I told him. And it was. My three year old, husband and I all had a fun time. We took in a performance by the L.A. Opera at the Children's Stage and caught a demonstration of teen poetry slam (it was really awesome). Mouse met a young author who isn't much older than her (well, closer to her age than mine--I don't think the girl is a teenager yet). She also met Llama Llama, who was much taller in person than I imagined he'd be. I got to meet mystery author Kwei Quartey, who is just as nice as can be. He writes the Darko Dawson series set in West Africa. I also saw T. Jefferson Parker, Cara Black, Denise Hamilton, Marissa Meyer, and Sarah J. Maas, among others. Mouse was surprisingly patient. Or maybe it was just because her dad was really good at keeping her entertained. It might have involved a few tosses in the air, hanging upside down, and being chased around a tree several times. I am glad we were able to go this year, and I hope I can drag my husband and daughter back again next year. I finished Shanghai Girls by Lisa See just in time for my online book group discussion, which started yesterday. What a book it was! It took a lot of restraint not to dive straight into Dreams of Joy, Lisa See's sequel to Shanghai Girls. If there is any hope I can finish Blind Assassin by Margaret Atwood before the end of the month as planned, however, I knew I needed to get started on that one. I may still start Dreams of Joy yet though. Who says I can't read more than one book at a time? Ten days after the war ended, my sister Laura drove her car off a bridge. The bridge was being repaired: she went right through the Danger sign. The care fell a hundred feet into the ravine, smashing through the treetops feathery with new leaves, then burst into flames and rolled down into the shallow creek at the bottom. Chunks of the bridge fell on top of it. Nothing much was left of her but charred smithereens. I'm glad you and your family had a wonderful time at the LA Times Festival of Books. I'd love to go if given an opportunity. I've yet to read Blind Assassin, though I'd heard great things about it. The thickness of the book is enough to drive me crazy, lol! Melody - I hope you will be able to come one day, Melody. Then we could meet! The size of Blind Assassin is a bit intimidating, isn't it? I am loving Margaret Atwood's writing style at the moment. How I'd love such an event even if it was for just a few hours. Though I've only read a few of Margaret Atwood's book I've always been impressed with her writing. Definitely a book I'd carry on reading if this extract is anything to go by. Tracy - It would have been nice to go both days of the festival, but with a 3 year old, I don't think that would have been wise. LOL I did miss sitting in on the panels this year, but it'll be awhile before I probably am able to do that again. Still, we had a good time and there's plenty to see and do. This is my first Atwood and so far, I am impressed. I know this won't be my last by her. I love book festivals, but have only been to the local one we have here in Orlando, which is pretty small compared to yours. Even if you don't get to see everything, it seems like you always learn something or get excited about a new author. I did just finish We Are Water by Wally Lamb on audio. I would highly recommend that audio...one of the best I've heard in awhile. Sandy - I do too! Book festivals can be so much fun. I am sure we missed a bunch of stuff, but we tried to see as much as possible. I am glad you enjoyed We Are Water! I never made it through The Hour I First Believed in audio. I may go back and try to read the print version at some point, but the audio was a wash for me. Oh, the authors you saw! I find it interesting that without the name of the author, the arresting title, or the cover-- I probably would not keep reading after the opening paragraph. I am really enjoying Blind Assassin so far. It is slow going, but, oh so interesting! I didn't realize Shanghai Girls had a sequel! I haven't read it yet but I did enjoy her debut many years ago. I love The Blind Assassin but it does take some time. I'm jumping between books right now. Halfway through East of Eden, maybe a quarter through the second Outlander, and I'll need to start my book club book at the end of the week. I don't normally like having this many books going but I can't seem to help myself! Glad y'all had a great time at the festival of books! Dads entertaining little ones certainly goes a long way! Trish - Based on the ending of Shanghai Girls, I would think there would have to be! LOL Luckily, I knew ahead of time there was. I'm going to come right out and spoil the ending by saying it's a cliff hanger. I just realized I have a tour book coming up soon, so may have to set Blind Assassin aside to read it. I am enjoying Blind Assassin right now, but definitely see what you mean about it taking its time. Laurel-Rain - I am glad you liked Blind Assassin. That's always promising to hear, especially early on in a book. I would definitely keep reading this one. I have a marker in this one. Started it but felt too rushed to continue. It seemed like more than one plot going on to me. I did like it. Hope to get back to it at some point. Will look forward to reading your memes about it. Hmmm, I'll try to avoid a spoiler. :) The writing is beautiful. Not surprised since it's Margaret Atwood, a star of literature. Tea - Blind Assassin does seem like a book that shouldn't be rushed through, doesn't it? I get that impression about it too. It's definitely written in an interesting style-- a novel within a novel, newspaper articles, etc. Not quite what I expected. It's never too early to start kids going to literary events! ;) It sounds like it's a great family event. Kelley - I've always been a little intimidated to try her. I'm glad I finally am giving her a go. I'm about 70 pages into 'The Philosopher's Pupil' by Iris Murdoch, and I'm not sure yet how I feel about it. It's very grim. Normally Murdoch is one of my very favorite authors but this book isn't going down well. I love Atwood, and thought 'The Blind Assassin' was a great book! Laurie - I haven't read anything by Murdoch, although I have heard her books are well received. I will have to add her to my must read author list. I am really enjoying Blind Assassin so far. The writing is beautiful! I love the intro, but your comment that you're "working your way through it" makes me nervous! Sounds like you aren't really getting pulled in? Believe it or not, I've never read Margaret Atwood and probably should! Sarah - I had just begun reading Blind Assassin at the time and was a little confused about the format. Once I figured out what was going on, I was immediately pulled in. I'm really enjoying the book now. This is my first by Atwood, but, even now, hardly a dent in the book, I know I will read more by her in the future. Sounds like a wonderful day at the book festival... I'd love to attend one some day! 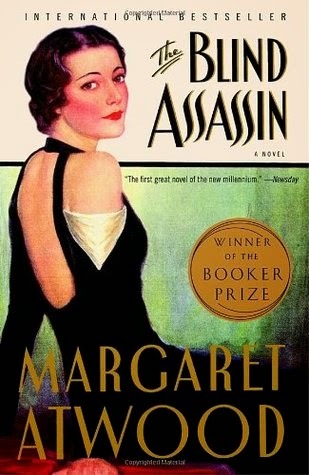 I've enjoyed a couple of Atwood's novels, but have never gotten around to The Blind Assassin. I'd like to eventually. JoAnn - It was such a great day. The weather was perfect--not too hot and not too cool, too. I hope to try some of Atwood's other work at some point. My husband has been trying to get me to read Blind Assassin for years. He thought maybe I'd like it and so far he's right. I remember trying to read this particular book years ago and couldn't get into it. Hope you have a better time with it. The LA festival of books is on my list of events to attend. I was speaking over the weekend to a friend who lives close to the venue and has attended. We agreed to try and go together one of these days. Catherine - Blind Assassin different, and the format threw me at first. I love the writing though. Hopefully it will continue to hold my interest as it is now. I hope someday you are able to attend the L.A. Festival of Books. It is such fun! Kelly - When I first asked my husband if we could go, he told me he would stay home and watch Mouse, and I could go by myself. I told him no, I want us all to go! I wanted Mouse to experience her first book festival. I wish we'd spent more time browsing the children's book sections for her, but there's always next year. Margaret Atwood comes highly recommended by a friend, and the opening is interesting, so I would definitely keep reading! I always planned to go another year, but never did! Linda - How exciting! The first year I attended the book festival in L.A., I met up with several other book bloggers--it was such a great experience. I didn't get to meet up with anyone this time around, although we tried. One of my favorite parts about sitting and listening to the author panels was learning about other books I just needed to read even though I'd never heard of them before. Great fun! I've never read Margaret Atwood either, but heard so many good things. This certainly is a great opener and I would continue. Peggy - I'm enjoying it so far. I hope you get a chance to read it! Powerful intro Wendy -- I'd read more. The book festival sounds like it was fun. Glad your husband was a good sport. Diane - Isn't it? It pulled me in. I am glad he was a good sport too. He enjoys reading too, so it wasn't too hard to convince him. :-) He especially likes checking out the booths dedicated to graphic novels. I haven't read this author yet, but this sounds like a good book. I doubt I would keep going. I'm not a Margaret Atwood fan. I find her books are depressing. Sorry. I hope it works for you. Good to see you, wondered where you were! Maybe you didn't get to a panel, but if you've not been round the booths so much before it sounds a good reversal. Glad to hear Mouse had fun, and how interesting that such a young person has had a book published! The little girl author (she was 11 or 12) was so excited to sign a book for someone (it must have been her first) that she ran over to a woman who I assume was her mother and told her about it afterwards. It was cute. I ended up buying a bundle of the two books, Shanghai Girls and Dreams of Joy, when I got it for my Nook. I am glad now I did! I actually have a paper copy of Shanghai Girls, but I decided the deal for the two e-books was worth it--and more convenient for me. I want to go the Festival so badly! Definitely on my to do list when it doesn't involve flying a 4 year old cross country! I haven't read either Atwood or Shanghai Girls yet but I will one day. So glad you had a good time! Maybe (hopefully) the festival will become a family tradition, and Mouse will be asking when the book festival is again. It's neat how family traditions can get started, and some of them need a little push from Mom. *remember that time we saw all the books? I've liked some Atwood; some not. Blind Assassin was a not, but I'm listening to Maddaddam right now, and I'm on the fence in the first hour. I liked Year of the Flood, so I'm being patient. Elizabeth - I hope it does! I think it would be fun to go every year, and maybe as Mouse gets older, she'll be interested in some of the panels and we can give them a try. I'm still not very far into Blind Assassin. We'll see. How wonderful you made it to the Festival! My sister lives in LA and I always tell her she has to go and give her suggestions for panels to see insisting she take notes and report back to me. But for some reason she always refuses, I just don't understand ;) Blind Assassin is a great book, and no, there is no reason you can't read more than one book at a time says someone who never has fewer than three books in progress at any given time. I juggle two books and an audio book at one time sometimes, but not often. I tend to get so focused on one book, I prefer to stick with it until I'm done. It depends though. Slower books occasionally get set aside while I sneak in something quicker paced. That's right - you start that other book now! :) I forgot that there was a sequel to Shanghai Girls. I need to find that because I remember being a bit disappointed with the end of SG and would like to see if it was just because of the set up for the sequel. And, what a wonderful time you guys had. I bet the older Mouse gets she'll have even more fun at the book festival as there are things for her to enjoy! Iliana - Haha! I haven't yet, but I do want to soon. I forgot I have a tour coming up, I need to set Blind Assassin aside to read. So Dreams of Joy will have to wait a little longer. I can't wait to see what happens to Joy and to see if Pearl catches up to her. I was at the book festival also! I was so happy we got to fly in for it this year. I went to a few sessions on Saturday and then walked around the booth. I hope to go next year too! Glad you had such a good time and managed to get there. Kathleen - You were in town and you didn't tell me?! I am glad you got to go!